← Get Rid of Raccoons Before Hibernation Season Begins in Indiana! Raccoons are not only aggressive scavengers, they are also very curious critters. For this reason, it is common to find raccoons in all sorts of odd places searching for a meal. In residential communities, raccoons are known to trespass in attics, crawls spaces, porches, garages, sheds, and more. But in commercial settings, one of the most common places to find a stray raccoon is in a dumpster. 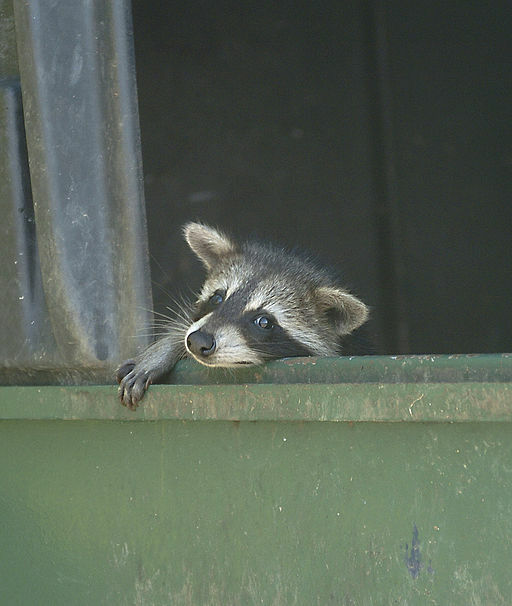 Dumpsters, after all, are like free food buffets for raccoons. They will go to great lengths just trying to access one, and if successful, they will dig through the garbage for hours looking for any morsel of food they can find. As a commercial property owner or business manager, it can be disheartening to find a raccoon stuck inside your building’s dumpster. Not only do you feel sad for the little critter, you are fearful of what it can do to you, and anxious about how you are going to handle the issue. Fortunately, there is a very simple way to deal with a raccoon in a dumpster. Continue reading to find out what to do and how to prevent it from happening again. The first thing you should do when you discover a raccoon stuck in your dumpster is to remain calm. Keep in mind that the raccoon is more afraid of you than you are of it, so do not fear an attack. Raccoons rarely attack, and usually only do so if they are strongly provoked or rabid. Never attempt to touch the raccoon, and never tip or shake the dumpster to persuade the raccoon to move. Simply turn around, walk back inside, and wait to see if the raccoon can get out on its own. If it is truly stuck, move onto the next step: call a wildlife removal company. Once you have seen a raccoon stuck in the dumpster, your next step is to contact a licensed wildlife removal company that offers raccoon control services. They have the knowledge and resources to safely remove the raccoon from the dumpster and relocate it to a faraway natural habitat. Be sure to choose company that retains DNR licensed professionals with extensive experience dealing with raccoons, and who provides safe, humane, non-lethal raccoon extraction and exclusion. If the raccoon is not stuck, and escapes after you discover it in your dumpster, it is not necessary to contact a wildlife removal company. They can, however, provide professional advice on preventing raccoon problems in the future since you are now aware that raccoon activity is taking place around your building. 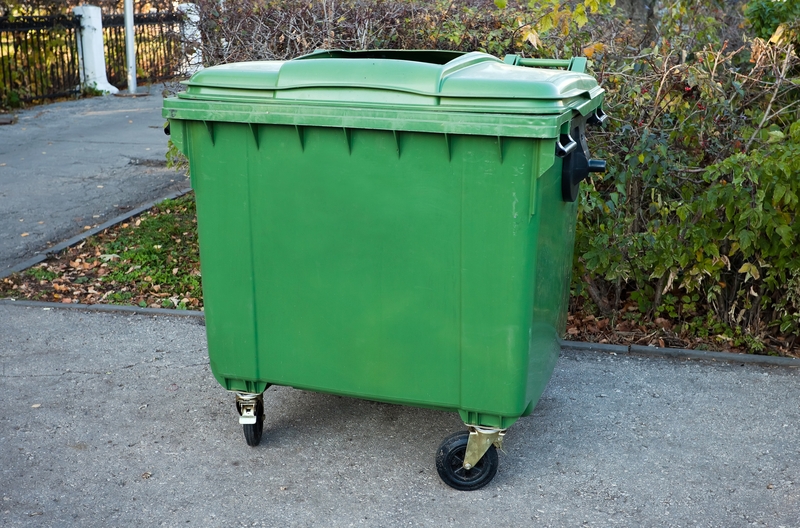 They will suggest tips like securing your dumpster lids with concrete blocks or locks, or replacing old and worn dumpsters with modern ones. Call 317-257-2290 for prompt and professional Indianapolis raccoon removal, anytime. We are DNR licensed wildlife control contractor who offer a wide range of residential and commercial wildlife removal services, including 24 hour emergency service, minor attic restorations, cleanup, free estimates, and more. Call 317-257-2290 to request a free estimate, today. 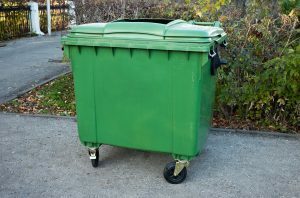 This entry was posted in Raccoon Removal and tagged commercial raccoon removal, get raccoon out of dumpster, Indianapolis raccoon removal, raccoon control indianapolis, raccoon in dumpster, remove raccoons. Bookmark the permalink.